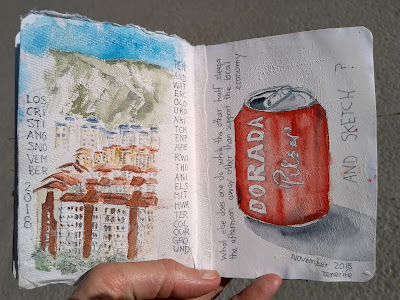 I'm back from a super restful time hiking and (of course) sketching in Tenerife. I always take a travel journal with me together with pens and paints. This time I took my sailor fude pen (the green one), a grey Pitt pen, my mini Cass Art watercolour quarter pans, my home made W&N gouache pan set , glue, kitchen paper. 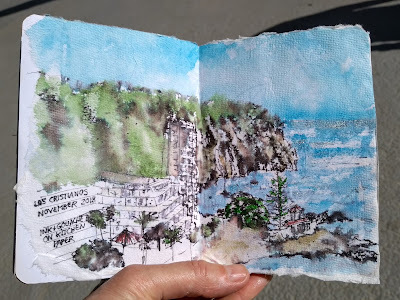 I had prepped a few pages of my extremely cheap journal with Daniel Smith watercolour ground, and also brought along a few ACEO sized pieces of tinted watercolour paper. Lots to play with, and it all fits inside a pencil case 😁 Two waterbrushes and bottle lid for extra water complete the set. First up, in the airport waiting for our gate to open, and layla, on the 4 hour flight. These were sketched with my water soluble sailor fude pen (hehe it's obviously the ink that's water soluble, not the pen - that would be tricksy to use in the extreme). If you haven't seen one of these pens in action, search for the White Rabbit on YouTube, she does some amazingly inspirational work with one. This next one was the view from our hotel balcony in Los Cristianos. The surface I used is kitchen paper glued down with PVA. It's very absorbent so the paint moves around super quick, which makes for a lovely loose sketch. Water soluble pen and Gouache. On the left is another view from our balcony. Here the surface is kitchen paper that has been glued down with PVA, then coated with Daniel Smith watercolour ground. This makes the surface much less absorbent whilst keeping the texture of the kitchen paper. The paper has been prepped with Daniel Smith watercolour ground. 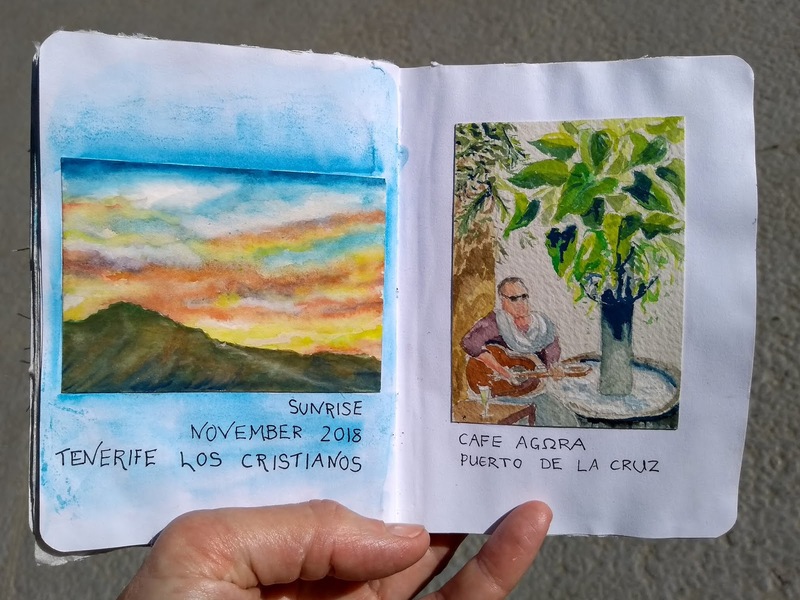 On the left: on white watercolour paper, this was painted at sunrise using watercolour and white gouache, wet into wet to get a lovely soft and hazy look. 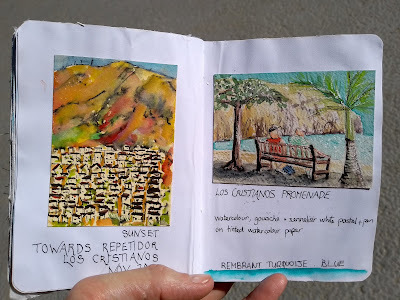 On the left: Sunsets were so dramatic, with the beautiful colour cast on to the local caldera. Watercolour and gouache and water soluble pen on tinted watercolour paper. On the right: our last day. 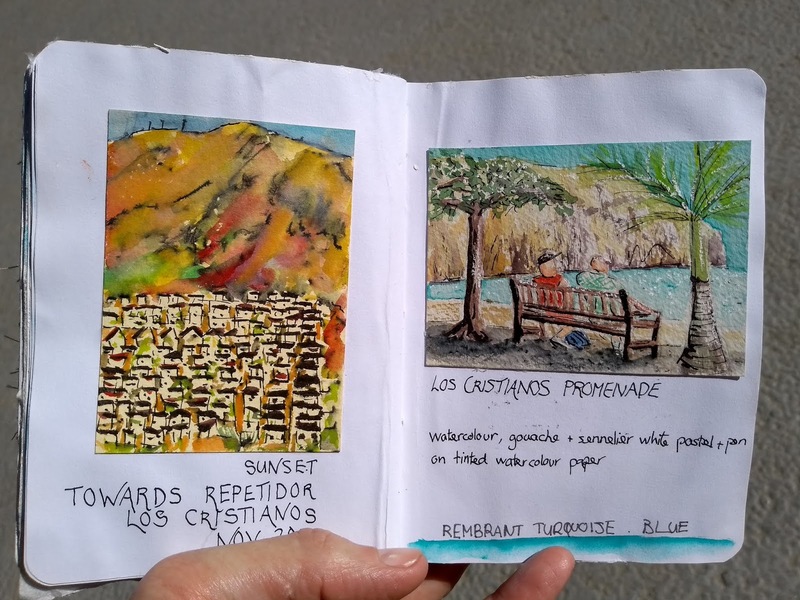 I found a really good art shop in Los Cristianos where I bought a new watercolour from the Rembrandt range. I've never tried these ones before, and so far I'm impressed. I also bought a beautifully creamy bright white sennelier pastel, so if course I had to try them out on this random couple who were sat on the bench on the promenade. I hope you enjoyed my sketch journal! I certainly enjoyed making it, and would encourage each and every one of you to have a go. 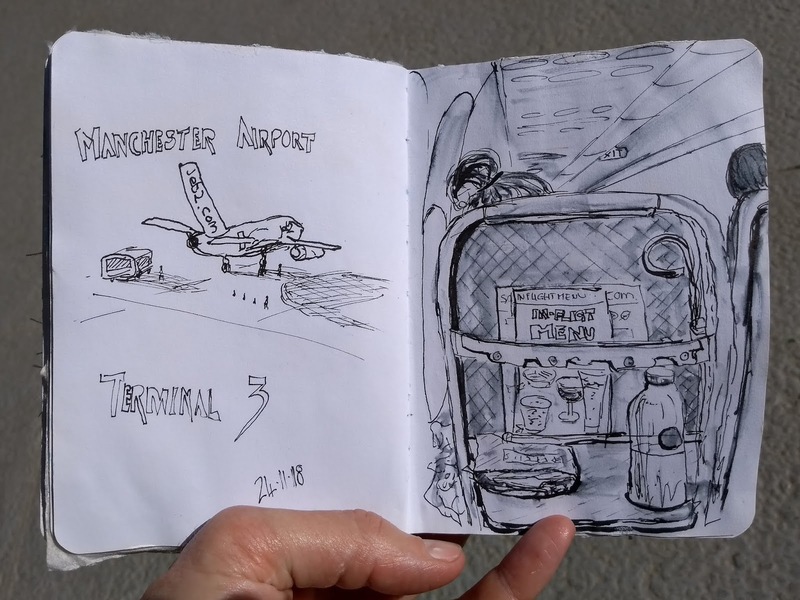 These sketches mean so much more to me than any photos of my trip.